We are launching a call for volunteers for the Organising Committee of our next Fusion event. If you have ever wondered how you might be able to contribute to shaping IABC and make a positive difference to our chapters and members, then we invite you to consider nominating to serve on the IABC Asia-Pacific Region Board. 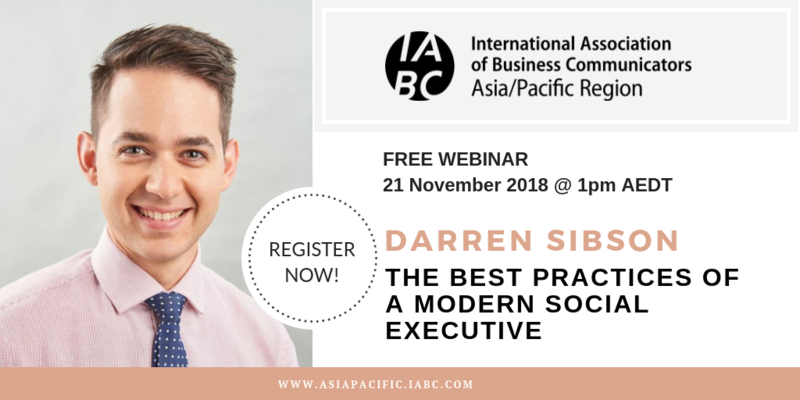 Serving on the IABC APAC Board will help you to develop personally and professionally, to become more valuable to your organisation or clients, and to gain greater access to professional content, communications best practices and enhanced networking experiences. Nominations are open from Friday 11 April and close on Sunday 12 May. Board roles will commence on 1 July 2019 following confirmation of the Board slate at the Region AGM. Full details of the commitments and requirements are included in the 2019/20 information pack. If you would like to nominate, complete this form and submit to iabcasiapacific@gmail.com by Sunday 12 May. The Corporate Affairs Summit is the significant event for Corporate Affairs and Communication executives in the region.Join us on 21 & 22 May 2019 to network with the most influential national and international communications leaders and learn from corporate strategies of the world’s highest performing companies at the InterContinental Double Bay, Sydney. Register here using our unique discount code IABC25 to receive 25% off your ticket as a member of the International Association of Business Communicators. We are looking forward to seeing you there. 2019 WORLD CONFERENCE SCHOLARSHIPS: APPLY NOW! IABC Asia-Pacific is pleased to offer four scholarships (valued at $A1,500) to IABC Members and Leaders in our region to attend this year’s IABC World Conference in Vancouver, 9-12 June 2019.
provide World Conference insights via social media throughout the event. provide a final post-conference wrap-up to share with members thorough-out the region. Funds will be reimbursed to recipients’ bank accounts by wire transfer upon issuing receipts to our Treasurer. Please complete the application form and email it to iabcasiapacific@gmail.com. Application deadline: Friday 29 March 2019. Scholarship recipients announced: Wednesday 3 April 2019 via Twitter/LinkedIn.